Making coffee at home is an uphill battle, typically fought with outdated weapons while totally exhausted. But fear not, tired coffee warrior, because it's simple and actually quite affordable to increase the odds of making a perfect cup at home. 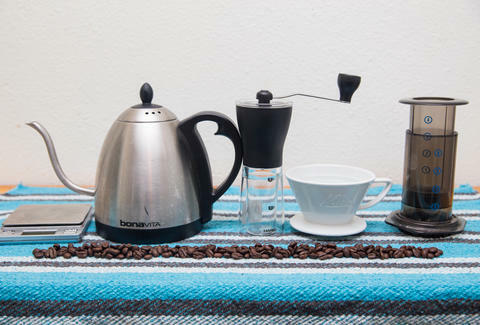 Just pick up any of these six items, then keep calm and brew on. The best coffee shops in the country use coffee grinders that costs as much as a used Ford F150, but it's hard for most home brewers to justify spending more than the price of a pizza on one. 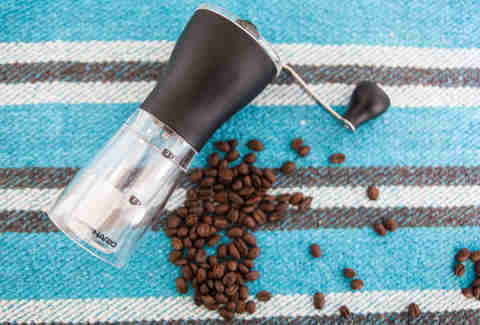 Experts preach the consistency and control of burr grinders over inconsistent spice grinders, and the most affordable option is the manual Hario grinder, which creates an even grind for a measly Andrew Jackson. Those slow concentric circles that baristas pour over coffee grounds aren't just to waste time or flex their fine-art degree. 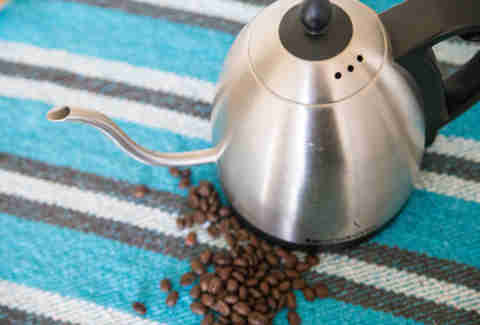 How coffee is saturated makes a difference, and a sloshing saucepan of boiling water has all the control of a fire hose. Dropping $30 on a gooseneck kettle adds a level of precision, but it's also just much more fun to use. Depending on nerd-level, a kettle with a digital temperature display is also a solid choice. The most expensive coffee you can buy at a coffee shop is typically pour-over, but the surcharge is for the labor, not the equipment. 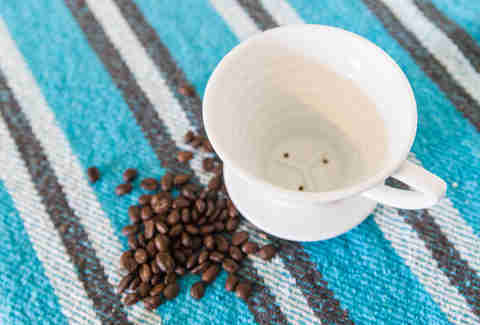 Almost every pour-over device costs less than $30, because they're basically just ceramic funnels with holes at the bottom. The two most popular models are the Hario V60 and the Kalita Wave, both devices for which we have to thank the Japanese. 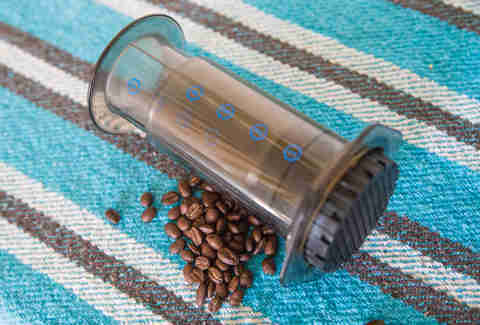 Splitting the difference between a pour-over and a French press, the AeroPress is a darling of coffee nerds everywhere. Part of the appeal is that the weird little gadget was designed by the inventor of the frisbee, but its first-place finish in our definitive brew method test proves that it's not just a toy. Measuring by the scoop is great when it comes to generous ice cream shops, but not with coffee. 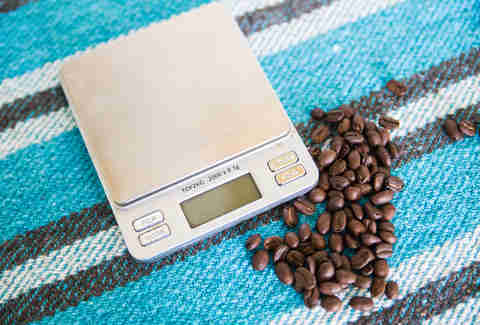 Weight is a far more accurate method for gauging how much coffee to use, plus a cheap digital scale has plenty of other kitchen uses. I stand by the $16 Smart Weigh Pro, but there are also more expensive, coffee-specific models with features like built-in timers. Choosing the best grocery store coffee is like a game of "Would You Rather": none of the options are actually that agreeable. 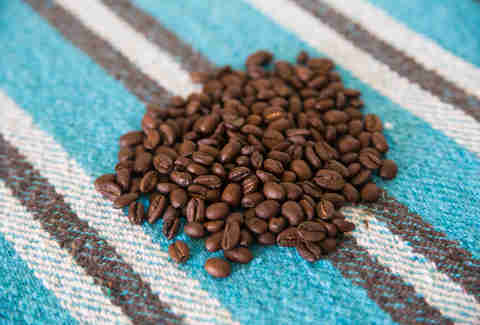 Opt, instead, for a subscription service that delivers freshly roasted beans. You'll dodge trips to the store and easily be able to try a variety of different origins. Most of the roasters on our 21 best list offer this type of service, but we highly recommend Madcap, Intelligentsia, or Verve. Dan Gentile is a staff writer at Thrillist. In addition to all these gadgets, he is also the owner of a very nice Mexican tablecloth. Follow him to on-fleek linens at @Dannosphere.